As more and more people are attempting to leave less of an environmental footprint, new technology is popping up to meet their needs. One such product is the composting toilet, a lavatory option that doesn’t use water, eliminates human waste, and requires less space in your home. Many people, especially those living off the grid or embracing life in a tiny home are looking for viable water-less toilet options for toilets with no plumbing. 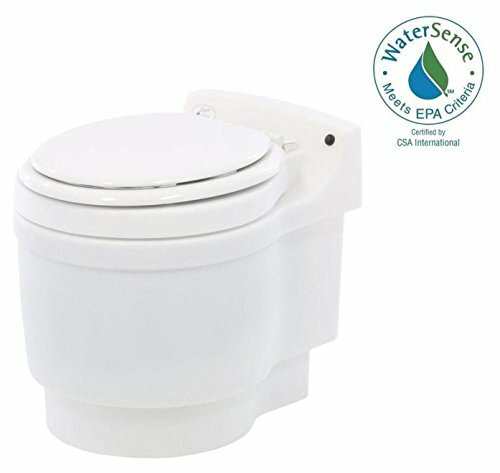 There are numerous brands that produce composting toilets, but today we are going to look at two of the newest and most unique toilets on the market: the Separett Villa 9200, and the Laveo toilet by Dry Flush. Which is the better composting toilet? Composting toilets are not actually a new technology. In fact, the first toilets that turned human waste into compost existed in the mid-19th century. The benefits of composting waste have been known for generations. The advent of central plumbing and sewage systems made composting toilets largely unnecessary in cities, but they have always served a purpose. Composting toilets have a lot of benefits, and some drawbacks. The main benefit is that these toilets don’t use water, which saves money, reduces waste, and has a far lesser environmental impact. For people living in smaller homes or in remote areas, they can also be vital. On the other hand, composting toilets aren’t an option for every home and not everyone is going to appreciate the smell of a compost heap or the need to deal with the composted waste once a sufficient amount has accumulated. Those are just a few of the considerations that should be made before investing. If you are currently in the market for a compact, functional toilet that is a friend to the environment, you should know about a couple of unique models that are available. As the description above suggests, most composting toilets are a simpler solution than a septic tank for people that live in rural areas off the sewer grid, with the waste being removed from the home and decomposed in a separate chamber. Not every home has space for this kind of chamber, which is where Separett and Dry Flush enter the conversation. 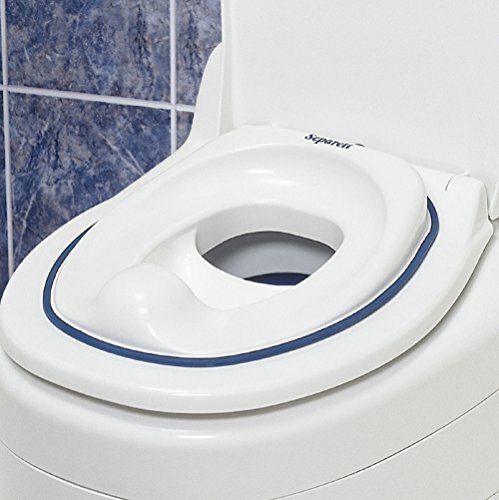 As I said above, there are numerous composting toilet brands on the market, but the Separett Villa 9200 has set the bar high. Separett is a Swedish, family-owned company that has been in the industry for three decades. They specialize in environmentally-conscious products, and the Villa 9200 (9210) is the crownjewel of their product line. Villa 9210 vs. Villa 9200: These models are basically identical except the the 9210 comes with a is available with a 12V fan for remote homes or cabins that do not have access to a 110-120V power supply. The fan (2.5W, 210mA) works with a battery and solar power. Last time we checked (July 2018) the retail price of the two models was also the same. If you’re a proponent of the Tiny House movement or are just a fan of the reality shows, there is a good chance you have seen one of Separett’s toilets in actions. In addition to being great for the environment, they are compact and relatively easy to install. For anyone trying to keep things simple, the 9200 meets your needs. One of the biggest concerns for composting toilets is that they have a tendency to release an unpleasant smell if the room is not properly ventilated. The 9200 has a 2-speed fan to mitigate that concern. This composting toilet is electric and can be powered by a 12V DC battery or a solar-power source. One of the causes of unpleasant odor is an anaerobic environment caused by the mixture of water into the solid waste that kills or hampers aerobic organisms. This toilet has a crafty solution for that problem. The inside of the 9200 is designed so that urine and solid waste are deposited in separate locations. A concealing view screen covers the solid waste container until someone sits on the pressure-sensitive seat. If all of that doesn’t impress you, you should also know that the 9200 is designed so that it can work in any environment, no matter the temperature. It also can be equipped with a child seat. Unlike a lot of traditional composting toilets, there is no separate chamber for the waste. The waste remains in the toilet in a compostable liner bag which is then empty as needed and disposed of in a safe disposal area. For this reason, the 9200 can be installed in almost any home as long as there is recourse for the ventilation pipes to reach the outside. Compared to Separett, Dry Flush is just a sapling of a company. This American-based, veteran-owned company came into being in 2012 in the city of Hamden, Connecticut. The Laveo composting toilet is Dry Flush’s only product, but their success will surely lead to new products down the line. Like the 9200, the Laveo is powered by a 12V DC battery. It also collects the waste inside the toilet to be emptied at a later time. Those are the two main ways in which the products are similar, but there are some notable differences. The main one is that the Laveo is completely portable. There is no ventilation pipes to install. The toilet can be set up in your home or packed up and taken on the road. It’s certainly a nice alternative to a campground restroom facility, assuming you can find some privacy. Since ventilation pipes are there to reduce odor, you might be concerned that the Laveo will be insufficiently odorless. In fact, what makes Laveo so unique is its “proprietary barrier material” that completely traps the odor in. The waste is double-bagged and sealed tight so that no odor escapes and there is no risk of accidental exposure when emptying the toilet. With the waste stored in a lined container upon flushing, it is easily emptied once the base has reached capacity. The lined containers come in cassettes that need to be replaced after approximately 17 flushes. The battery lasts for around 300 flushes. It’s hard to say which of these two toilets is the best option. The Laveo lacks the Villa 9200’s more unique features, like the urine separator and the pressure-sensitive seat. On the other hand, the Laveo is also cheaper and is more portable. If you were looking for a sturdy toilet for your home, you would probably be wiser to go with the 9200. For frequent travelers or people who just need a lightweight, portable toilet, the 27 lbs. Laveo should meet all your needs. They are definitely different products with their own pros and cons. Still, both the Separett Villa 9200 and the Laveo By Dry Flush are waterless, chemical-free toilets that will help reduce your environmental footprint, cut your water bill, and help you live with less. If that is appealing to you, you would be wise to give each one of them a consideration. 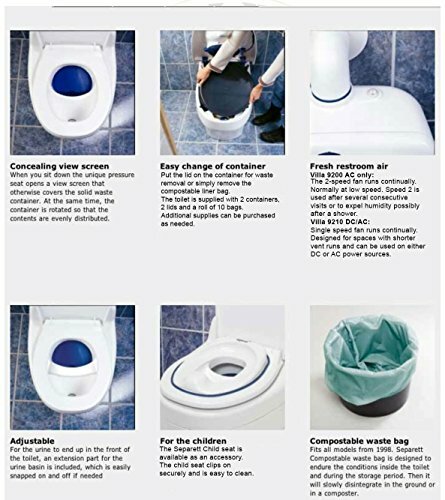 Still have questions about buying a composting toilet, see our Buyers Guide and FAQs Here.